In the Enneagram system of personality, the sixth style is called the Questioner. Things don’t feel safe, as though one is at sea or rolling around on balls or wheels. Where will my greatest safety come from – a strong, brave stance or a weak “protect me” one? Whom can I trust? Is this object hollow or solid? Are you pushing me or am I pulling you? Am I safer standing on your shoulders, with you standing on mine, or with like-minded warriors both on top of me and underneath me? Is there safety in numbers or am I better of going it alone? Maybe I need to learn to scare people off before they have a chance to get me. It helps to lean on a bigger authority sometimes or to put on my boxing gloves. My mind is always whirling around with these thoughts of how to protect myself so I can be prepared for anything. In “The Enneagram of Parenting” I don’t use the words in the paragraph you have just read. I let the cartoon speak for itself instead. In fact, I drew this cartoon about thirteen years ago and never quite put the concepts into words for myself until now. I did feel, however, that the whirling symbols seemed like the Questioner (“what if…?”) part of myself, one of my wings since I’m a 5-Observer. For each of the nine styles of children, I drew one cartoon meant to represent the general idea of the style. This was that cartoon for the Questioner child. I hope it conveys the feeling-tone accurately enough for them and their parents and teachers to relate to it. It’s a challenge because there are many variations within each style. In this case, though, I feel it has held up well. Questioners want to know who the authority is and I think this authority is someone you can count on. He has such a strong face I think it’s okay he doesn’t have legs and it’s kind of funny he’s made out of a question mark. In fact, that’s probably a healing aspect of the cartoon. Just what a Questioner might dread the most is right here for all to see and is creating no problem at all! The authority is itself poorly balanced on a ball, not even touching it! So, at least in cartoon-land, you don’t need an anchor after all, you see? The cartoon is YOU in most of your Questioner aspects, suspended with no security, yet surviving instead of toppling over. This all wouldn’t work if it was spoken in words as I have just done. But I hope it does work as a cartoon. 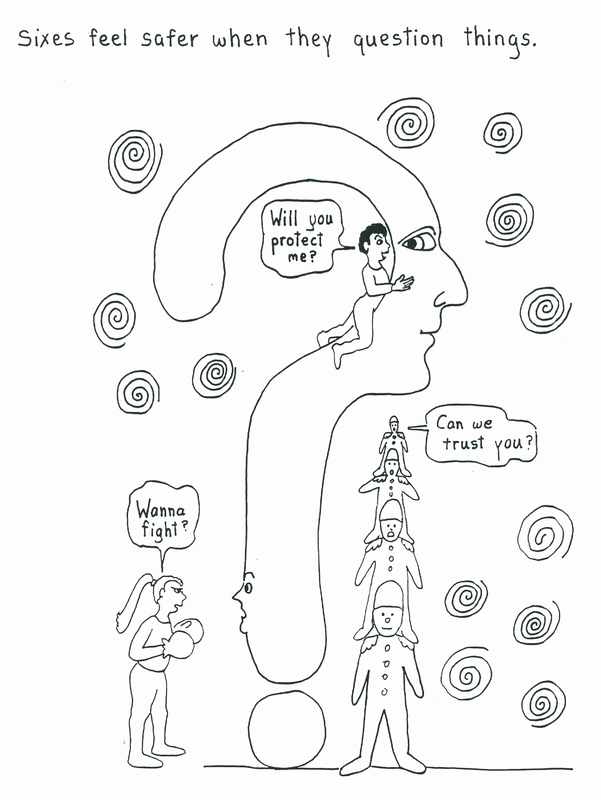 Questioner children need order, predictability, and to learn to trust their inner authority. They need to learn to built confidence in themselves and in their ability to meet new situations, which means they need to be treated with patience and calmness. My book helps parents and teachers by showing learning styles and what different types need in terms of adult attitudes. Children vary a lot in their inborn traits that govern how fearful they are, their study habits, social adjustment, and so much more. Please go to http://bit.ly/dzQSKe to see the blog I uploaded on the Psychology Today website today.